Prague is a perfect destination for a short city break! For me it’s a compact city where most of the important sights are within walking distance. I was also treated well with sunshine through my entire trip! I don’t think Prague is the destination for shopaholics but it is a beautiful city for history and architecture enthusiasts as well as beer and comfort food seekers. In this article I will cover the must-sees, tours, accommodation and of course the best bars and restaurants! The number one must-see in Prague is the Old Town area and the famous astronomical clock of the Old Town Hall. The Old Town might look like an architectural mess but that is what makes it so uniquely appealing. Prague Old Town has so many pretty buildings! On your way to the Prague Castle you can check out Charles Bridge which is the most important bridge that connects the east and west side of Prague over the river Vltava. The bridge is beautiful and the views are worth seeing but it is really crowded. The tourists, local salesmen (and pickpockets) are present throughout the day but the bridge is slightly less busy in the morning. That’s the best time to visit the bridge. There’s a lovely view from the Charles Bridge to the Prague Castle! A bit off from the other sights is the one that I really like, the Dancing House! Dancing House was on my must-see list due to its quirky architecture. It is such a unique building where the other half of the entrance is curvy and it looks like the house is leaning towards one direction. Pay a visit there even just for the sake of a few photos! Do you believe in ghost stories? If you want to hear the creepiest legends and stories about the spirits that haunt the center of Prague, join McGee’s Ghost Tours. I had an evening tour of Ghosts and Legends of Old Town where I learnt all the creepy legends that surround the Old Town. What happens on the church’s stairs when the church bells ring? That you will find out on the tour! Creepy ghost tour in Prague! If you are more into beer than ghosts you can take a beer tour from Prague Beer Tours. Firstly, it’s not a pub crawl! It consists of some beer but the focus is on learning about the beer making while visiting a microbrewery as well as two other bars. During the tour you will get to taste different types of beers and some local delicacies on the last stop. It was great to learn about the beer itself because I didn’t really know how different beer types are brewed and what gives each beer a unique taste. what is the difference in the process or what makes the difference in their taste. I’m a Czech beer expert now, yey!! If you don’t enjoy ghosts or beer then your choice could be a daytime tour of Old Town organized by the Prague City Tours which is the tourism authority of Prague. The tour takes approximately two hours and it takes you around the historic center. I really liked hearing about the history of Prague and began to understand what the small details on the buildings or on the pavement actually mean. Prague has a very colorful history that can be seen in its various styles of architecture which is really interesting. Want to know why the Old Town Hall has a show in its clock tower every hour? Take the tour and find out! The perfect continuance for the tour of Old Town is a visit to the Old Town Hall and tower. The Old Town Hall has guided tours that will focus on the history of the town hall and the symbols there. The tour takes about 1,5 hours and is organized by Prague City Tourism. If you are hesitant about taking the tour, at least make a visit to the tower! 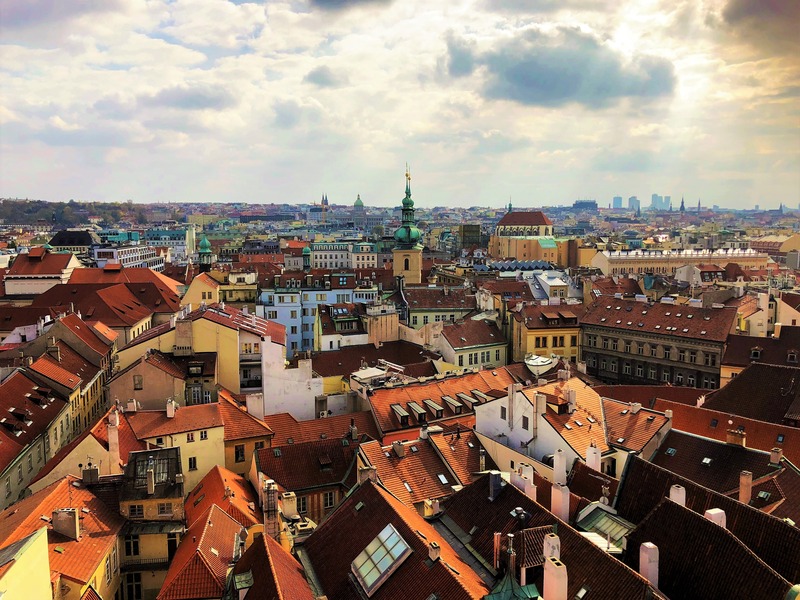 The tower of the Old Town Hall has a wonderful 360-degree view over the city of Prague. This one you cannot miss! I stayed in two different hotels during my stay in Prague. The first night was at Hotel Angelis which is located in Smichov area on the west side of river Vltava. It is a lovely hotel with spacious rooms and outstanding service. The bed was very comfortable, not too soft, not too hard, just perfect. In the Smichov area there are restaurants and bars nearby and you don’t need to worry about the crowds like in the Old Town. Hotel Suite Home is an apartment hotel in Nové Mesto area which is about 15 minutes’ walk away from the Old Town and from the Dancing Hall. So the benefit of this accommodation is definitely location! The apartments of this hotel are really spacious and they consist of a kitchen, a living room, a bedroom and a bathroom. I would say that this hotel is perfect for groups of friends or families that want to fit all in one place. And why not for couples too! In Hotel Suite Home like in Hotel Angeles the bed was one of the highlights! I got some of my best sleep in a long long time in that bed! I would go to the hotel of Hotel Suite Home just for the sake of this comfy bed! Bar Hemingway – It’s a funny thing, I’ve said I don’t really like cocktails. They are usually too sweet or too sour so I try to avoid them as much as I can. But thanks to many recommendations, I made a visit to Bar Hemingway which is a high-class cocktail bar in Prague. (You even need a reservation there!) They really know their business and I got the best cocktails of my life there! I guess now I must say that I like cocktails after all. Even though you wouldn’t like cocktails, go to this place and order a Blackberry and Vanilla Caipiroska because it is heavenly good! The BEST cocktail I’ve ever had! Cafefin – It was really a great coincidence how I even got here! I decided to head to the National Monument on Vitkov Hill which is also a great viewpoint and I walked through the Prague 3 district. I was super hungry and decided to stop by really needed a place to recharge when I saw this cafe. It was a cozy cafe with a lot of young adults drinking coffee. I decided to order an avocado and beef sandwich which I later found out happens to be their specialty. And that truly was a sandwich to die for! It was super juicy and had the amazingly large variety of flavours. Restaurant U Medvídků – This restaurant is a great choice if you want to experience traditional Czech food. It’s not a fancy restaurant so expect really simple cooking but delicious original flavours. I tasted two dishes made of deer and wild boar and I really liked both of them. It was the first time I tried beer ice cream too! For travelers on a budget, this restaurant could be your choice. It is located only a few steps away from the Old Town. I tried beer ice cream for the first time and I did like it! Restaurant U Zajíce – Always wanted to try green beer or honey beer? Head over to U Zajíce in the Old Town. On a Saturday night there was also really good live music. The restaurant is located under the street level so you don’t really know how it looks before you arrive there. What you will find, is a cozy tavern restaurant with great food to go with your colorful beer. The delicacy you must try is Trdelník which is a roll of pastry cooked and sugared. You can choose your filling and I could recommend you chocolate (but be careful with your clothes) and ice cream! I love to go off the beaten path also on my city break. This time I ventured out to a viewpoint located in Vitkov Hill. I took a subway to the closest station and started climbing up. I guess I found some sort of a side entrance. At least the surroundings looked slightly shady so I recommend taking the actual route there from the south side of the hill. The climb all the way up was good exercise and great views along the way. When I arrived up to the viewpoint I was surprised. The viewpoint was also a war memorial for the Czech general Jan Žižka. (Pretty different compared to Finland’s Mannerheim and his riding statue in the center of Helsinki.) The viewpoint has an awesome view to the city and to the television tower. Come here if you are a bit more of an adventurous type! By the way, did you know that the television tower has very weird details on it? There are babies climbing up the tower! If you think the area of Prague 3 is too much of a trouble I would suggest going to another viewpoint next to the Prague castle. You don’t necessarily need to go in to the Prague castle to see the best views but there is an amazing spot that has views over the vineyards and over Prague city. It is on the way to the castle and there is a lovely café where you can rest your legs and enjoy the stunning views. It’s also quite affordable: five euros for coffee and cake. Totally recommended! Rest your legs at a restaurant next to Prague Castle and enjoy the stunning views! Prague is a lovely city that you should add to your bucket list. It’s perfect for a short break and there’s something to see and do for everyone’s taste. I really loved the beautiful architecture of the city as well as stunning viewpoints, tasty food and the beer of course! But best of all: just take the time to sit down, order an excellent pint of local beer and watch as other people rush to make the most out of their time in Prague while you enjoy your cold beverage. Are you planning on a city break in Europe? Maybe you’d want to check out Rome or Madrid!